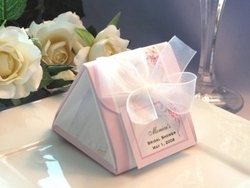 UNIQUE and ONE OF A KIND ~ Taken from the old art of Japanese paper folding, our Bridal Shower Origami Favor Boxes are simply beautiful to behold and an elegant gift for your guests. This lovely piece is constructed of 110 lb. print house quality card stock and measures approximately 2 3/4 inches wide by 2 3/4 inches long by 2 1/2 inches high. Our uniquely designed favor box is beautifully printed with your choice of design on all four sides of the box. 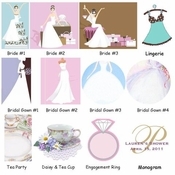 Inside we place a lovely *"gift" of your choice then we wrap the origami with a sheer Organza ribbon and finally finished with a personalized favor tag. Candle scents includes maple sugar, candy cane, wedding cake, ocean breeze, chocolate, rose or lavender - depending on inventory supply.